You never know who you're going to bump into in Stratford! Stratford is alive with the arts throughout the year. 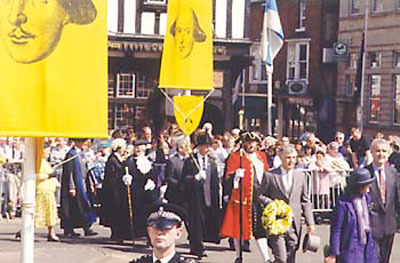 As well as the professional performances at the RSC, Shakespearience, Civic Hall Theatres and other venues there are also the many and varied active amateur groups who perform a variety of events throughout the year. To find out more about them select from the list below, or find their performances throughout the Programme of Events for 2007. We continue to work on the list of activities for 2007 throughout the year.